Luxury rose gold staples with 100% metal, superior quality high carbon steel wire reduces buckling and jamming. These staples serve a variety of typical fastening needs. With a ¼" leg length, they can hold up to 25 sheets of paper, making them perfect for most projects. Sharp chisel points are designed to quickly cut through and securely fasten stacks of paper. Chisel points promote productivity, working to prevent jams and disruptions. Rose gold staples are for use with any standard size stapler. Ideal for your home, office space, desktop, school, and anywhere paper is being stapled. 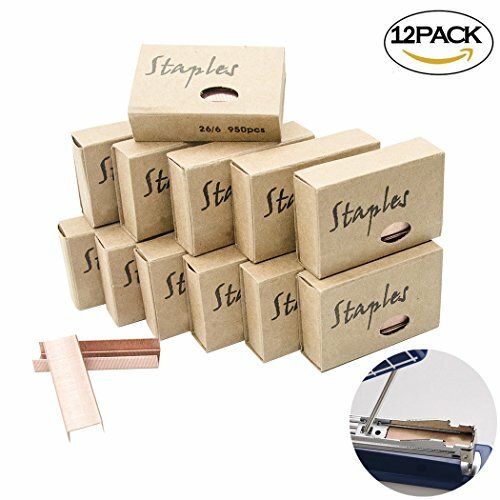 - 12Pcs x Standard Rose Gold Staples, 950 staples per box, 11400 staples(12 boxes) per package. High Quality Materials - Luxury rose gold staples with 100% metal, superior quality high carbon steel wire reduces buckling and jamming. Standard Staples Fit Most Staplers - These rose gold staples are a convenient choice. Designed to work with most standard staplers, they simplify the supply process and allow for easy refills. Useful Staples - Our standard staples serve a variety of typical fastening needs. Chisel point for easy penetration, ¼" leg length, they can hold up to 25 sheets of paper, making them perfect for most projects. Multi-site applications - Ideal for your home, office space, desktop, school, and anywhere paper is being stapled, make an ordinary task fun. Package Include - 12 Pcs x Standard Rose Gold Staples, 950/Box, 12 Boxes/Pack 11400 Count. If you have any questions about this product by Hatisan, contact us by completing and submitting the form below. If you are looking for a specif part number, please include it with your message.